Love them! They look great - true to color. Enjoy added style and privacy with this Aurora Home faux silk curtain panel pair. The solid print of easily coordinates with just about every decor style imaginable. A grommet top makes hanging the panels simple, and tie backs are included for added convenience. Choose from a multitude of different colors to find the hue that complements your space the best. For ease of care, these curtains are machine washable.These curtain panels feature a triple-weave polyester blackout lining, which helps keep out damaging UV rays. Great for use in rooms with east or west facing windows that receive direct sunlight, the panels also work to lower your energy bills and keep uncomfortable heat out. For proper fullness, panels should measure 2-3 times the widthof your window. First and foremost, these are GORGEOUS curtains! I bought these curtains in Ivory for my bedroom and it fits perfectly with the rest of my decor. The blackout liner was very soft and flowy, which surprised me considering that these are blackout curtains. The material looks/feels expensive and can fool anyone if you tell them its real silk. However, I definitely wouldnt say these are 100% blackout but more around 98%. On an extremely sunny day, I noticed some sunlight coming through the curtains but it was very subtle and it didnt bother me. Anyway, these are great curtains for an even greater price. Color: I ordered the color IVORY, however I ordered this color due to the picture which showed it looking a bit more like a white color with gray undertones that made it look more like a cool-toned white versus a warm-toned ivory - It was more true to the picture than to what I deem as an Ivory color which is why I am VERY happy with the color. I was looking for something more white than ivory colored. Blackout: this does block out light, but I believe due to the white undertone color it does not block out as much of the light as a darker colored drape would. I have the burgundy colored ones as well for the Fall and Winter seasons and those leave the room black during the day and pitch black at night. Sound blocking: I can hear the difference between when I have the drapes open and when I close them. It does a decent job of muffling the sound, but it is not more than a 50% reduction. Overall I would recommend this product to another customer, but making sure they are aware if they go with a darker color the blackout effect is more effective, but I wanted these more so for the color and I LOVE the color. The only TRUE blackout curtains I have found! I've spend a considerable amount of time trying to find off-white curtains that are truly blackout. Since my bay window will not accomodate a double curtain rod, I needed panels with blackout lining attached. I ordered and returned no less than 9 different panels from various stores that were described as "blackout" or "room darkening" but only had a flimsy white liner that completely let the light through. These panels, however, have a sewn in liner that is the same fabric you'd find if you bought separate blackout panels to hang behind normal curtains on a double rod. The quality of the faux silk front fabric is very nice; it doesn't look cheap or plasticky at all. And, best of all they do NOT let light through! My only complaint is the color of the grommets - they are a dark reddish bronze color.. I'm sure it would look fine on darker colors but they clash with the Ivory color. Width is actually 52" per panel. I purchased these curtains mainly because I thought the width of each panel was 104". Instead they are 52". 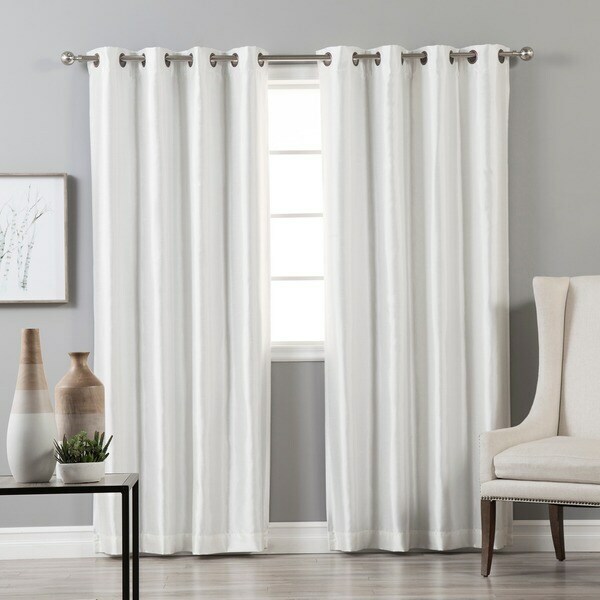 The wording of this particular item description was misleading, as almost all other curtain dimensions available on Overstock are listed by how long/wide EACH panel is. To me, "84 inches long x 104 inches wide per set of two" sounded like each panel was 84"x104" and there are 2 panels in each set. As I have fairly large windows, I wanted wide panels which when drawn, can least seamlessly cover half the window. Some curtains are indeed extra wide so that's what I thought I was getting with this. Because these are faux-silk, the quantity for money is no longer worthy of the price. I could get similar sized & quality curtains elsewhere for 30-50% less than this. Buyer Beware! Drapes are very thick and block all light. They are made of polyester but look like a richer fabric. Photo is true to color for the grey. Removed from package and the wrinkles came out after hanging for a few days. I have looked at many different brands for a nice-looking, white, functional set of blackout curtains. I am into neutral colors with clean, modern touches and the faux silk panels do it for me! They block our light nicely and look great as a frame for our plantation shutters. I was originally going to get a much more expensive panel that would have cost me an additional 100$ (would've had to buy two since it didn't come in a pair like this one) but I ended up getting these because: 1) My boyfriend just had to have blackout curtains and; 2) I was reaching my spending limit. I wasn't thrilled about this because I was concerned that these curtains would not meet my expectations due to low quality. 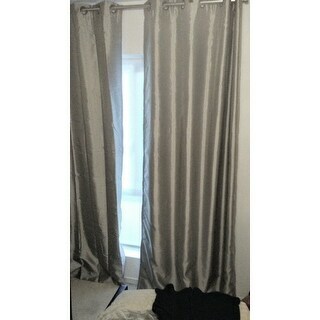 However, these curtains are amazing for the price! Not only is it good quality, you can also iron it yourself, it really does block out 95% of any incoming light, and you get TWO panels for this price! We got the silver color and I would say its true to the color on the screen. I love the curtains. They look so much more expensive than they actually were. The only thing I would suggest is the color of the grommets be changed. I don't care for the brown grommets against the silver curtains. Wow--these curtains are so elegant! I was so pleased with how they look--very good quality, and they have a sheen just like a much more expensive fabric!! Very, very nice, and I've actually considered ordering a set or two for my living room!! Would highly recommend. I love the fact that these curtains have a white fabric backing. The fabric is nice and heavy and some what insulating. I purchased four panels for a bay window with three windows and it worked perfectly in conjunction with a bay window curtain rod which was also purchased at Overstock. I am very satisfied with this purchase and I would also purchase these curtains for other rooms if needed. They are a good value. The white color has a tint of silvery gray. The quality is very good. The material is of high quality but the white color has a grayish tone to it. I think it is because the blackout panel behind it is a think gray color reflecting through it. I will keep them because they are well made and the price was reasonable. Once I finish painting the room which will ironically have gray/blue tones in it, I am sure the curtains will blend well. Really love them! Look gorgeous and when I say they met my expectations, that's a huge positive. My expectations are normally not met by most of my online purchases. Remember to order 2-3x the length of your window. I followed another reviewers advice that the wrinkles would just work themselves out after hanging, but that's not true. Have had them up for 2 months and they still have the folded wrinkles. Planning to steam them when I get around to it. All in all gorgeous curtains in the dark gray color. I'm so happy to have "easy care" drapes. The dupioni silk drapes they are replacing were too expensive to have cleaned. I decided for the price I could replace them with something I could wash on my own. These cost me less than one dry cleaning for the old set! They look very nice. These are beautiful and well made. They are a lovely addition to my living room, and I would definitely buy them again. True to size, and the fabric has a lovely, pearl-like sheen that I love. Very elegant. These are very nice quality curtains. Ordered them in gray for my patio door. I plan to pair them with a white set of curtains purchased from Overstock also. These curtains are beautiful, very luxurious looking with a rich, heavy feel. There is a hit of a silverish shimmer so not pure white, but beautiful and can work with any decor. LOVE them. They are huge and perfect for my plan to leave a panel on only 1 side of each window as it will widen the appearance of the room. The quality is quite nice. They look like real silk. Love the color and quality. I was not thrilled with this set of curtains at all. It did do a decent job of blocking out the light. But the appearance of the curtains looked cheap to me and so shiny like a disco. "Does the curtain have weights on the bottom?" "Grey color is showing the same picture as Dark Grey, I would like to purchase the lighter more silvery Grey . Please advise. with sincerest thanks"
"What color is the grommets on the navy and dark gray?" "Can someone please describe the gold color for me? They look a little chartreuse-ish on my monitor. Is it a true gold? Do they have a good sheen? Thanks!" In my opinion, they are true gold and do have a sheen. "Are the pink curtains a light pink?" I would describe them as a bubblegum pink, so they are between a light and medium pink. "What color are the grommets if I purchase the Red color panels? It looks dark blackish in picture." I bought the cream color drapes and my grommets are a coppery color. "104 inches long per set of two....Does this mean each panel is 52 inches wide?"